Compared to last week, western Canadian yearlings and calves over 700 lbs. traded steady to $3 lower on average. Weakness in the fed cattle market weighed on the heavier replacements. Alberta packers were buying fed cattle at $155 on a live basis, down $7 from the highs seven days earlier. Barley prices were up $3-$5 per tonne compared to week-ago levels. Keep in mind the Canadian dollar has strengthened about four per cent from its Jan. 3 lows, which also resulted in a defensive tone. All these factors have contributed to the weaker market for heavier replacements. Medium- to larger-frame, fleshier Simmental mixed steers weighing 925 lbs. traded for $183; medium-frame, medium-flesh mixed heifers averaging 845 lbs. were quoted at $169. In southern Manitoba, Charolais-blended fleshier steers averaging 800 lbs. were valued at $182 while larger-frame mixed heifers weighing 825 lbs. were quoted at $162. The calf market traded $5 on either side of unchanged, compared to seven days earlier. The polar vortex hung over Saskatchewan and Manitoba. Extreme winds once again prevailed in southern Alberta, although temperatures fluctuated in positive territory. Vaccinated and semi-weaned calves traded at a premium but unvaccinated were discounted accordingly. Buyers didn’t feel comfortable shipping lighter-weight feeders longer distances and risk discounts were noted in some regions. Weakness in August and October live cattle futures also set a negative tone. On the flipside, strong demand was evident on healthy vaccinated grassers, most notably in southern Alberta. Black Angus-blended vaccinated steers weighing 500 lbs. were valued at $233 in southern Alberta; mixed vaccinated heifers weighing 510 lbs. were quoted at $202. In central Saskatchewan, mixed vaccinated steers weighing just over 600 lbs. reached up to $213. 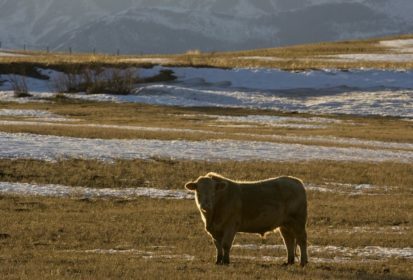 U.S. cash feeder cattle markets traded $2-$4 higher on average despite the adverse temperatures. U.S. feedlot margins are hovering in positive territory but in Western Canada, the Alberta fed cattle price is about $7 below breakeven. — Jerry Klassen manages the Canadian office of Swiss-based grain trader GAP SA Grains and Produits Ltd. and is president and founder of Resilient Capital, specializing in proprietary commodity futures trading and market analysis. Jerry consults with feedlots on risk management and writes a weekly cattle market commentary. He can be reached at 204-504-8339.